If you celebrate Easter but are staying in South Orange this year, chances are that you’ll want to indulge in a nice Sunday brunch or early dinner. We have a list of some restaurants around Third & Valley that you can count on for a great Easter meal! Boccone South – Old Fashioned Italian cuisine with a Modern Mediterranean flare. For Easter, they will open at 1:30pm and serve their extensive dinner menu. The pasta and fish dishes are known to make guests happy, especially the Guitarra Boccone and Pappardelle Funghi. Boccones is also BYOB so make sure to bring a bottle of wine to pair with dinner. Don’t forget to try their Tiramisu for dessert! McLoone’s Boat House – Enjoy Easter brunch (10:30am-3pm) at this well-established restaurant. Their buffet brunch is one of the best in New Jersey. Guests will enjoy their display table filled with fresh baked bagels, croissants, muffins, cheese boards along with omelet, waffle and carving stations. Chafing dishes include bacon and sausage, gourmet French toast, frittatas, maple salmon, mushroom risotto and more. For dessert, you can feast on fresh fruit, handmade cakes, pies and pastries. McLoone’s is located within the South Mountain Recreation Complex and sits on the banks of the reservoir, which showcases spectacular views to customers. The Manor – Since 1956, when they first opened their doors, The Manor has been known for serving elegant a la carte dining in The Terrace Lounge and their World-Famous Lobster Buffet. 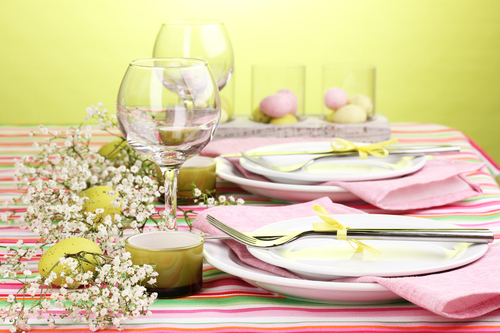 On Easter you have the option of doing their 4-course Holiday Menu (seating from 12:30pm-7pm) or the brunch buffet from 11:30am-1pm which also includes a mimosa.